Who of my Current superiore, in alto Five preferito Fruits Basket characters,who is YOUR Favorite? I Amore all the animal! who do te think is cute? If Hiro were 14-16 who would he most likely b like? What episode did Kyo confess his Amore for Tohru? Tohru had many preferito holidays, so when one came around she always imagined it to be perfect. Somehow, some way she had Kyo in the cucina making riso balls along with her. He was quite the hand in the kitchen. His riso balls were almost perfect, if there were such a thing. 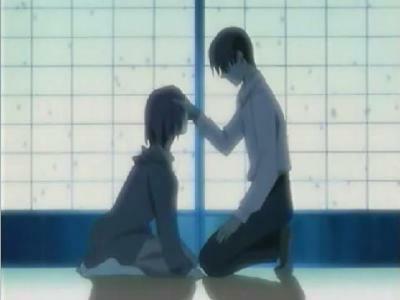 Tohru never ceased to disappoint on any case especially Natale she was proving to the entire Sohma family just that. Dressed in a cute Santa outfit picked out just da Shigure she managed to please everyone at the banquet Yuki and Kyo were running late picking up some più snacks and probably taking even longer figuring they fought the entire time but Tohru didn’t mind her mind was far too busy on pleasing everyone. Dear my first treasure, I have loved te so much. I miss te when my cuore is strong and weak. I become joyful just to see te smile. Everything is saved da it. if te know the legend of the Chinese zodiac, then te should know that there are fifteen animali not twelve. the animali are, the rat, dog, monkey, horse,boar, tiger, sheep, bunny, rooster, cat, fox, and squirrel. In Giappone there is an ancient family, the Sohmas, who are cursed with these animals. since there is no way to tell who is going to be cursed, many of the Sohmas have stayed close to home for the protection Akito, God of the zodiac, offered. te realise that your strong the instant someone tells te so. te realise that your special when someone shows you, te understand Amore only when a person is willing to give it to you. That person, the one who makes te realise and see all this, that person is your happiness. Tohru, te are my happiness. a comment was made to the poll: From my superiore, in alto 10 preferito characters in the anime, who do te most favor? Why did Hatori HAVE to erase Kana's mind?